JDWC.org celebrates the life of Jonathan David Westlake Cole, his work as a painter and the inspiration that has become his legacy to many people through his paintings and of course quite simply for the person he was. As Jon had such a profound affect on so many lives, this site by default also celebrates the work and life of us all. If you register you will be able to add photos, documents, thoughts and recollections. "Painting has become my way of life. I have concentrated on this more than anything else." "When I was young I thought life would be acceptable if one had an obsessive vocation. At first, I thought I would be a missionary, and then a farmer. Accompanying my father on his preaching journeys, I would again be a missionary, briefly a footballer, and later a farmer. So I wrote poems and drew apocalyptic pictures, to describe the breadth of ways. Art can be a method, or a methodical way to make parts of the whole from one place. It is clear to me now that in the unknowing of child- hood, creativity and individuality are attempts to make tangible the notion that life ahead could be a natural or spiritual way." "Painting is an idea. It is this idea of belief, that painting might provide a lucid passage through life, and pictures themselves may be a vehicle, to provide room for belief." Jon, died, aged 44, in a road accident in Phnom Penh, Cambodia. 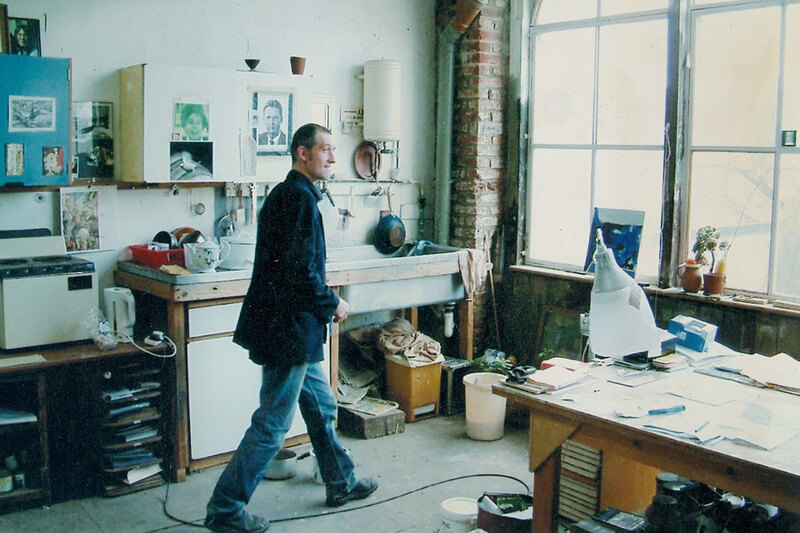 He applied the value of art as an ‘obsessive vocation’ to all endeavours in his life including his work with people who have profound disabilities and the Cambodian documentary project that he was collaborating on with his friend, the filmmaker Tim Corrigan, when he died. Born in 1962 to Brian and Linda Cole in Fareham, Hampshire, Jon was the second of five sons. Brian Cole was a headteacher and lay Baptist preacher and as a boy Jon and brothers, Philip, Simon, Tim and Marley willingly accompanied him on many of his itinerant preaching engagements. These encounters together with their overtly christian home life challenged and informed much of Jon's early thinking and his ongoing struggle with belief. 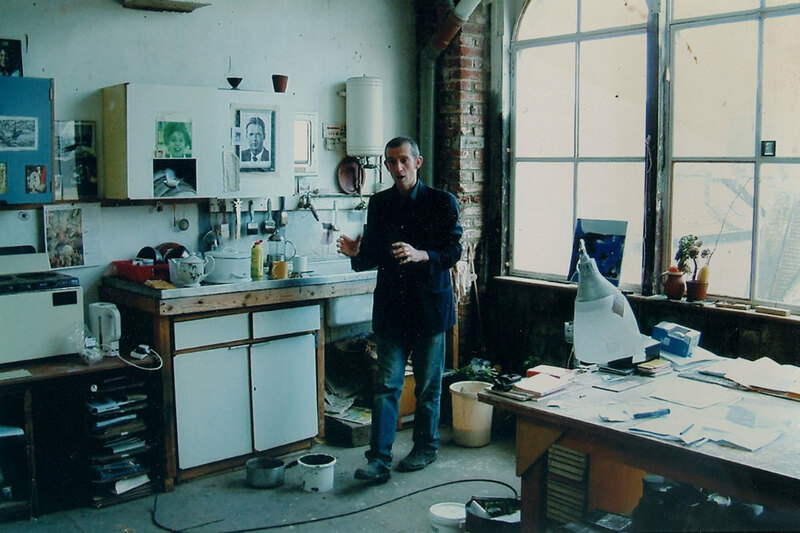 His experiences in London however did not sit well with his innate humility and reticence to engage with the more commercial expectations of the art world and in 1992 he moved to Hastings, East Sussex. Here, he continued his personal studies and teaching alongside his inspirational tutors, Rod Harman and Tony Colley who soon became his colleagues at the Art College. Whilst in Hastings, Jon and Caroline were married and Jon continued to paint and exhibit his work. Jon's love of football found an outlet as he started to play for local teams, first of all FILO (First in Last Out) a team he eventually captained and then Crowhurst, alongside local filmaker, Tim Corrigan. In 1997 Jon and Kate Adams co-founded [Project] Art Works, an artist–led organisation that creates opportunities for people with complex disabilities to make art. During initial residencies in schools for children with severe learning disabilities, they explored the use of materials and techniques including casting, etching and painting to directly express form, movement and gesture. Jon saw himself as a technician and facilitator whose knowledge of materials and processes enabled each child, whatever their cognitive or physical ability, to leave a record or trace of a moment of experience. As far as possible his approach remained non- directive, allowing a child to explore media in a way that made visible their individuality and way of engaging with the world. Exceptionally gifted in his ability to ‘connect’, Jon always remained calm when confronted with someone who used none of the formal, learnt methods of interaction. His patience and courage enabled people with even the most severe autism and cognitive impairment to explore a creative situation in their own way and at their own pace. Jon saw creative potential in everyone and could make art in even the most constrained of circumstances. His work developed into a series of dynamic interventions through projects that tested the impact of environment on learning and creativity. He used a large geodesic dome as an external space to run painting and film workshops in special schools in Hackney, Brighton and Hastings. ‘Landing’ the dome in the school grounds this satellite space interacted with the elements, charging the workshops with energy and surprise. mummy daddy. (40 x 60cm) Acrylic on board. In 2002 Jon and Caroline purchased a large elegant building next door to the public library in Hastings town centre. Named after its address; 12 Claremont, the building became a focus for their efforts to construct a complex of subsidised artist studios and independent, creative spaces studios, cafe and gallery. Jon was a natural builder and constructor and he devoted a lot of his time towards improving the structure of the building and making it fit for purpose. Funding was secured from the Arts council for the incorporation of a lift which involved a huge amount of graft for Jon who had to excavate a lift shaft starting from the basement to the upper studios. Unmoved by material trappings he lived simply with Caroline in a nearby flat in Linton road, Hastings and when their relationship became more difficult, in his converted attic studio at ‘12 Claremont’. Around this time Jon's youngest brother, Marley moved to Hastings with his new wife, Mana and Jon, Marley and Tim Corrigan, together shared the attic studio. Jon continued to paint but also used his natural film and video skills in their new collaboration as Outline pictures, a film and editing venture. This was the impetus for his visits, accompanying Tim on his trips to Cambodia to document the political changes taking place there. This website has been cobbled together from the pictures, writings, recollections and memories that have been available to date. One purpose for it is that others may contribute too and to that end the discussion pages take a blog format to enable the incorporation of other thoughts, comments or anecdotes. If you have any photographs or pictures of paintings or indeed any other relevant images to add then please send them to mail@colecorner.co.uk and we will endeavor to include them. As his brother Simon has written ... "through it we may remember and celebrate Jon's life, his work as a painter and the inspiration that has become his legacy to many people through his paintings and of course quite simply for the person he was." Jon attended Ravensbourne College of Art where he completed his Art Foundation and then studied Fine Art at Bristol Polytechnic where he met life long friends and his future wife, Caroline Le Breton. Graduating with a first class degree he went on to the Royal Academy Schools between 1986 and 1989 and won several scholarships and awards including the De Segonzac Travel Scholarship in 1989 that enabled him to study in Italy for several months. The quality of Jon’s painting and the interest it attracted led him into the heart of the London art scene. Jon lived for a while in Hackney, London where he took up residence in a number of rented and squatted houses with friends he met whilst studying in Bristol. At this time, alongside artist friends who included Neil Taylor, Mark Barnett and his younger brother Tim, Jon continued to explore his desire to find within painting, a way in which he might find a vehicle through which he could navigate and explore his own personal passage. At this time he was involved in a number of collaborative events such as the Guns of Hackney and Sanctum Sanctorum. Over the ten years since its inception the results of his and Project Art Works’ activities have been exhibited at the Brighton Festival, Millennium Dome, the De La Warr Pavilion, Bexhill-on-Sea, Tate Modern and other venues nationally. His legacy exists in the memories and experiences of those he taught as well as an extensive archive of video and photographic documentation and a number of Art Works’ publications. Primarily a painter, Jon continued to pursue his work privately and most often at night. He tended to avoid the mainstream art world, preferring instead to organise independent exhibitions most notably in Berlin (1996 and ‘98), Mumbai, India (1998), St Bartholomew’s Church, Brighton (2000), Spitafields London (2001), Newchurch, Romney Marsh (2002) and The Arches, Hastings (2006). The Paintings are an investigation of how appearance is influenced by the addition and subtraction of colour. Painting is a form of representation and the result of accretion. Or. the outcome of an attempt to paint single, flat objects which have an illusory appearance and which may function as immotive areas in space. What becomes apparent is dependant on that space as an idea. Painting for me is somewhere between a bird and a fly'.